Dynamite proudly presents The Misadventures of Grumpy Cat #1, featuring "The World's Grumpiest Cat" and her brother, Pokey! With her ever-present pout and sassy disposition, Grumpy Cat has won the hearts of people everywhere. Grumpy Cat is the perfect combination of unbearable cuteness, instant fan appeal, and established multimedia presence. If you love the memes, the videos, and that irresistible scowl, then get ready for the wildly fun antics of Grumpy Cat and Pokey in Dynamite's all-new, all-sensational Grumpy Cat comics! 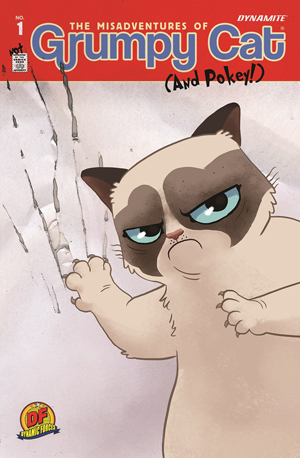 Grumpy Cat's global following includes 7.6 million Facebook fans and over 31 million YouTube views. Since her photos first went viral in 2012, Grumpy Cat has gone from Internet star to real-life celebrity. She has two New York Time Best Selling Books, her own Lifetime movie Grumpy Cat's Worst Christmas Ever (voiced by actress Aubrey Plaza), has made numerous appearances including the MTV Movie Awards, American Idol, The Bachelorette, The Today Show, SXSW, Good Morning America, and even hosted WWE Monday Night Raw. Grumpy Cat is Friskies official "Spokescat", has filmed videos with Disney and Sesame Street, and appears in commercials for McDonald's and Honey Nut Cheerios. FINAL COVER MAY VARY. ALLOCATIONS MAY OCCUR.